Many forex traders watch prices trade in narrow ranges for long periods of time, so they’re eager to trade breakouts when they occur. Since breakouts represent a sharp move in price, either up or down, traders focus on getting aboard the move as soon as possible. Over-eager traders are tempted to chase the price, which can be disastrous. The trick is to get in early enough, yet not too late. Success means identifying the signals of a forex breakout, then confirming them before entering the trade. 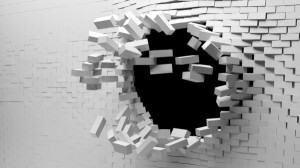 In this article we’ll look at a few simple, profitable forex breakout trading strategies. They can help traders avoid letting the price get away, while avoiding chasing losers. These channel-breakout trading strategies, called “pop-and-stop” and “drop-and-stop,” are especially effective around session-opening times. These simple strategies are focused on the major currencies — EUR/USD, USD/JPY, EUR/JPY, GBP/USD trading on hourly or daily time frames. They are short-term strategies based on only a few indicators. They rely on simple, unambiguous trading rules, and of course they’re expected to be profitable. The pop-and-stop forex breakout trading strategy is based on price action along with other trading indicators, such as the rejection bar candle chart pattern, Harami candle pattern, round-number forex price levels, Bollinger Bands, polarity indicators, or other indicators of nearby support and resistant levels. When using hourly or daily candlestick pricing, a 50-period simple moving average (50 SMA) is a good trend filter. The candlestick chart above shows a break out near the beginning of a forex trading session (left circle), as well as a bullish rejection bar that formed an unrelated pattern without a stop-and-pop trading opportunity (right circle). It’s usually difficult to know what causes the upside break until later – Often, it is due to a news announcement or simply the weight of heavy players taking long positions in the base currency. In any event, the price “pops” out of its previous range, then briefly “stops” before resuming its upward march. This trade opportunity is shown by the left-side white circle on the chart above. The left-circled chart pattern above shows 2 bullish rejection bars being formed and rejecting above a round price number, which is the gray line. 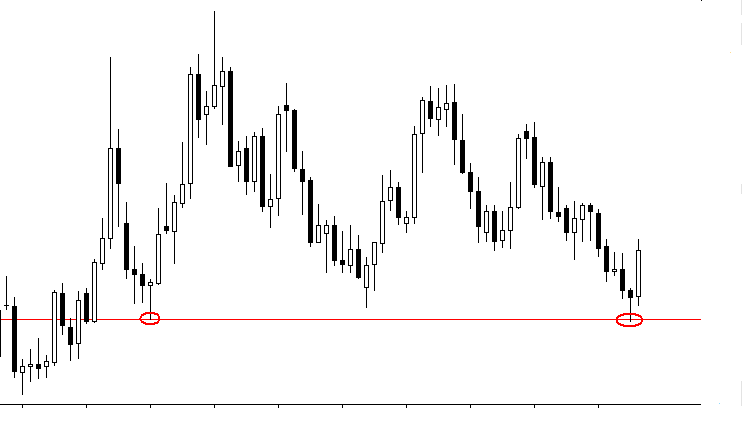 During the third period, the trade is entered at 2 pips over the high of the second rejection bar. Typically, a forex breakout in one direction showing a long candle is followed by a retracement back to the level where the price first exited from the range. This happens when the rapid price move has occurred because of a liquidity gap across a range with few orders. The gaps are usually filled sooner rather than later. If the gap isn’t filled, then the move is truly a breakout. Before executing a trade order, the trader should make sure the forex breakout is confirmed. After the initial “pop,” it’s important to wait for confirmation, since the price could continue to rise, or fall back into its recent range again. 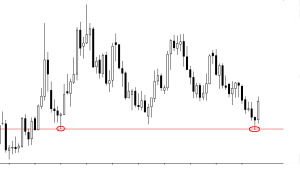 Rejection bars are the most common signal confirmation for the pop-and-stop forex trading strategy and other strategies based on candlestick chart patterns. This bar is typically formed when the price opens and moves first in one direction, then reverses to close the candle period at or past the opening price. When rejection bars find resistance at round-number forex price levels and other support-resistance-inflection points, it is a good sign that the price will soon move upward again. Ideal rejection bars show an open and close very close together – The closer together, the better. Ideally, both the opening and closing of the rejection bar are located near the end of the bar; the closer to the end of the bar, the stronger the signal. The tail on each rejection bar should be at least as long as the body. The longer the tail, the better the signal, since this shows stronger rejection from the low. The pop-and-stop confirmation signals can be based on round-number forex price levels, which are a common psychological support or resistance level. Also, for the bullish pop-and-stop confirmations, forex traders can use other support levels such as Bollinger Bands, polarity indicators, or nearby trading range levels. A mechanical forex trading system can be programmed to trade breakouts based on the candlestick charting parameters and other technical indicators. The Harami is a pattern which can help confirm both bullish and bearish breakouts, including the exit point from successful “long” trades. It consists of one long candle followed by a shorter candle whose body is within the range of the larger body. Regarding color – The bearish Harami in the below chart shows the typical downward-moving (black) candlesticks with significant “wicks” which signal an impending retracement. 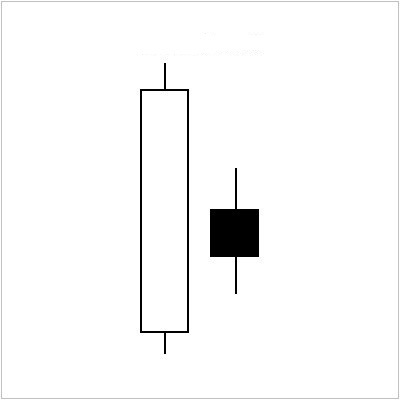 Mechanical trading systems can calculate the candlestick values and apply the appropriate trading rules to use Harami candles to signal either the end of a bullish runup, or a rally after a downtrend. As shown within the second white circles in the two price charts, the pop-and-stop strategy can be traded together with the counter-move reversal strategy, if the price happens to reverse and fill the gap. During a bullish breakout, the simplest way to trade the price move is to place a limit order 2 pips ahead of the strongest rejection bar. For an aggressive strategy, the stop loss can be placed just below the tail of the strongest rejection bar. A more conservative approach is to place the stop-loss order just slightly below the high of the recent range. The chart above shows the entry point for trading a bullish breakout using the pop-and-stop strategy (left circle) as well as the bearish signal for exiting the trade (right circle). The bearish candles form a Harami candlestick pattern. Forex traders can also take advantage of drop-and-stop bearish downside breakouts, which are the converse of pop-and-stop bullish upside breakouts. Likewise, drop-and-stop downside breakouts are especially tradable when major forex sessions open. The above chart shows the forex price faltering at the polarity indicator, then breaking downward in a series of strong bearish candles below the preceding range. The first drop-and-stop trading opportunity is shown in the left circle. Although the following candlestick wasn’t fully confirmed by bearish rejection bars, still, traders can enter after the close of the bearish candle. The mechanical trading system should set the entry point at one or two pips below the monthly pivot, as in the above chart, or another reliable indicator such as Bollinger Bands, polarity indicators, or nearby trading range levels. The second circle above shows another drop-and-stop trading opportunity, with a bearish near-rejection candlestick confirming the signal. The trading system should enter the trade at the low point of the strongest rejection bar or most bearish candle. After an apparent breakout, there is a risk that the gap may be “filled.” It’s important to use the subsequent rejection bars as confirming indicators before entering the trade order. It’s also best to trade a pop-and-stop bullish breakout in the direction of market sentiment, especially after news causes a price breakout from a narrow trading range. The pop-and-stop breakout strategy should only be deployed in the major, highly-liquid forex currency pairs which have enough support for the rally to continue. At the same time, the trader should be aware of upcoming news or corporate announcements that might quickly reverse market sentiment and fill in the recent price gap. High volume is the single most important confirmation for a breakout and subsequent showing of trend. Although forex markets are open 24 hours worldwide, volume varies during different time ranges. The largest markets are London/Europe, New York, and Tokyo/Asia. Predictably, the highest currency trading volumes happen when the New York and London sessions overlap for several hours. This is true even for currencies like Japanese Yen or Australian Dollar whose underlying marketplaces are not open during these time zones. And, the lowest total forex trading volume is often seen after the New York session closes, in the couple of hours before the Tokyo market opens. This is important because intraday and daily forex breakout strategies like “pop-and-stop” and “drop-and-stop” are more likely to be successful when there is a high trading volume and pricing range, and large number of market participants. Since London is a leading global forex trading and financial center, it often sets up a short-term trend which affects other markets opening at London’s tail end. The early part of the London session is especially promising for profitable “pop/drop-and-stop” breakout trades. With a good Expert Advisor (EA), the mechanical trading system can be prepared for breakouts which often happen at the open of forex sessions in London and New York. In fact, these breakout strategies work especially well for the London open. The pop-and-stop is a short-term, bullish breakout-scalping strategy. It’s best to set tight stops, say 2 to 5 pips, and take profits fairly quickly. When trading the major currency pairs, the safe take-profit limit seems to be a ratio of about 1.5:1 or perhaps 2:1. Beginning around 8:00 GMT when the London session opens, the mechanical trading system watches the highs and lows of the candlesticks. The system goes “long” if the forex pair price penetrates the high of either or both of the rejection bars, and the price is above the 50 SMA. The system goes “short” if the price goes below the lowest point of one or both of the rejection bars, assuming the price is below the 50 SMA. Position size should be limited to no more than 2 or 3% of the trading account equity. To reduce the risk of trading over-correlated currency pairs, the system places a maximum of only one open trade per day, whether long or short. Any forex trading strategy focused on breakouts requires appropriate risk management. When using “pop-and-stop” and “drop-and-stop” breakout strategies with confirming indicators, traders should use stop-loss levels only a few pips away from the entry points. For either long or short positions, the mechanical trading system automatically places the stop-loss exit order at a level from 2 to 5 pips away from the entry point. Once the price moves favorably, the trading system moves the trailing stop along to the next support or resistance level as shown by the preceding candles, and keeps it updated. Anecdotal reports of backtesting by some forex traders using these two breakout strategies have indicated potential returns of up to 60% in about 8 months, which is a compound annual growth rate of over 100% while max drawdown was less than 13%. Forex breakout trading with mechanical systems based on “pop-and-stop” and “drop-and-stop” strategies can earn respectable returns as long as the trader relies on appropriate confirmation that the breakout will continue, including rejection bar and Harami candlestick calculations, or other indicators such as Bollinger Bands and support-resistance oscillators. Before entering the market, a forex trader should check for high trading volume and a broad range of market participants. For traders who correctly time entries, breakouts can be very profitable moves. Do you use any breakout strategies? Hello! Tell me please what is your broker? Or where better to open an account when my nationality is American and I live there? We don’t have many options living in the US. Thankfully, all of our options are reputable. The options are FXCM, GAIN, Oanda and Interactive Brokers. Thank you a lot Shaun! Hello shaun, my name is yunus from Indonesia. I want to ask about elliot wave pattern to identifying the breakout. Is there any application for forecasting elliot wave pattern ? Or maybe if you may mention me some book/journal reference for elliot wave. I’ve been studying about fibonacci retrace, and in my opinion there’s a need to understanding an elliot wave pattern moreover if combined by fibonacci retrace to identified the breakout. I think it’s amazing that we have traders from around the world on the site. Welcome! I personally haven’t bothered studying Elliot waves because Elliot Wave technicians famously never agree on anything. If a topic cannot be mechanically defined, then I tend to ignore it. I’m not lacking for research ideas. A common tactic that I suggest for retracements is to study how the MetaTrader indicator called “ZigZag” draws its highs and lows. You have to know that there is a repainting period, so it’s not an indicator for cherry picking highs and lows. But so long as you keep your analysis to studying retracements, the ZigZag is a brilliant way to analyze whether Fibonacci offers any benefit to traders. “It’s best to set tight stops, say 2 to 5 pips, and take profits fairly quickly.” On hourly charts? You have got to be kidding. That stop is way too tight. Anecdotal my arse. That’s just not going to work. And the long list of supporting indicators leaves so much room for varied interpretation that there’s really nothing mechanical about the advise here. The idea of waiting for the pause after a strong breakout is the best thing to take from this article. These articles should also really spend more effort discussing exit strategies as that is arguably more important than all the focus on the entry. Anyway, thanks for sharing. I agree that’s too close for the active hours, although there are times of day when extremely tight stops make sense. I’ll be sharing my research on time of day stops relatively soon. It is an interesting article on that breakout type of things. My question to you. Do you use this concept to be part of your trading strategies? Or do you use Algo approach instead of what the article says??? such as Sb scores or Weighted digital score type of system of yours??? Or do you combine the two of these strategies?? I do not use this approach in my trading. Everything that I do is algorithmic. This article is intended for a different perspective for people that want to trade with discretion. hiii plzzzz tell me hiwayfx good broker or not ?? I’ve never heard of them, so I can’t comment because I don’t know anything about them. Hello, I understand there is a mechanical trading system on this system (light or adviser), where you can download it or watch? This strategy doesn’t lend itself to programming as an EA. When you see a breakout, it has to be relative to something. But relative to what? The last 20 bars? The last 50 bars? And then there’s the price congestion. For how long does it have to stay in the same area? The general idea is clear, but coding it into mechanical rules would require a great deal of analysis. The eye always cheat, do only see when what it want to see, not all the times where the indicator is giving a false signal, which is the majority of the times – the above examples are maybe true on these charts, but if looking at other similar charts and events, the outcome is another. Of course there’s variation. I don’t think anyone reading this article comes away expecting 100% winners.